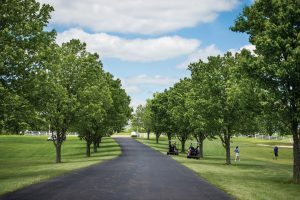 Golfers can enjoy a day on the links and help change the trajectory of cancer in Grant County at the St. Elizabeth Foundation Grant Golf Classic. Over the years, the outing has raised more than $75,000 for projects, including a new hospice room on the inpatient unit, treatment chairs for cancer patients and rehabilitation equipment that allows cardiac patients to recover closer to home. This year, proceeds will benefit cancer care initiatives specific to St. Elizabeth Grant. Two rounds of golf will be played, one at 8 a.m. and the second at 1:30 p.m.
Tickets, which are $500 for a foursome, include lunch, dinner and a player gift.